Whether you’re from Maryland or just a proud visitor EC Pops is the best place to get all of the Maryland gifts you could ever need! Whether you’re from Maryland or just a proud visitor EC Pops is the best place to get all of the Maryland gifts you could ever need! Come and visit us and we will help you put together a package that any Maryland fan would love to receive. EC Pops has loads of styles from Route One Apparel. We have t-shirts, tank tops, hoodies, and pajamas. We also have scarves and hundreds of different novelty sock prints. There really is something for everyone! For the sports fans in your life, or for yourself, EC Pops has a wide variety of Orioles and Ravens themed gifts. There’s clothing, accessories, tile coasters, and custom glassware that are all perfect for any Maryland sports fan. We have over 50 delicious popcorn flavors, in stock and ready to go! From sweet and chocolatey to tangy and spicy, come in and sample our delicious popcorn for yourself. Once you’ve tried them all, it will be easy to choose which ones your friends and family will like. 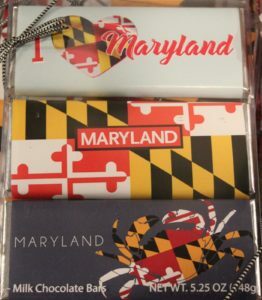 While you’re visiting us, please feel free to ask any of our friendly team members to help you choose gifts for your Maryland themed care package. We are here to help you choose all of the perfect gifts for your friends and family! This entry was posted on Friday, January 5th, 2018 at 5:22 pm. Both comments and pings are currently closed.